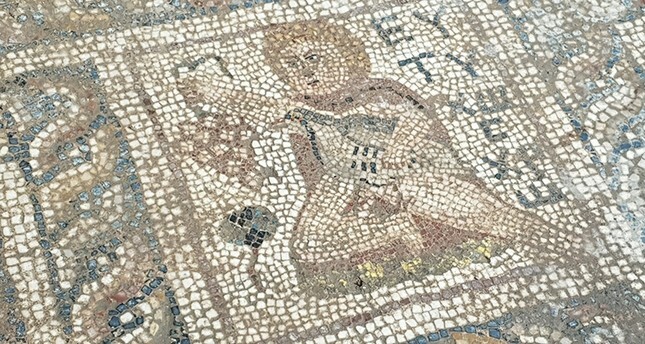 Ancient mosaics were discovered by construction workers in Turkey's southern Osmaniye province on Monday. "One of the mosaics has a radish on it. It also has a human figure holding grapes and a partridge in his hand. This shows that radishes have been farmed in our region since the first century," said provincial culture and tourism director Burhan Torun. "Here we find the mythological characters equivalent to Zeugma. This study will shed light on Kadirli's history. Also we found the first written document regarding Kadirli on those mosaics," Torun added. As a result of Alexander the Great's policy of mixing Greek people with indigenous populations, Zeugma had a symbolic value-it was an allegory of cultural amalgamation.